Donald Tusk, president of the European Council, said: “Hundreds of thousands of refugees go to Europe, because they know that our community is the most open and tolerant of all." “It is our common obligation to assist refugees as well as to protect the EU external borders," he added. “The first commandment today is restoration of control on the EU external borders as condition sine qua non of an effective, humanitarian and safe migratory policy.”, he added. Jean-Claude Juncker, president of the European Commission said: "We cannot solely look inwards. We need to make sure that we look at the issues that concern us in the periphery of Europe. Turkey and the European Union need to walk together [down] this path. We need to look at providing help to those unfortunate people who come to our shores." He also called attention to the Parliament's role in the refugee crisis: "The European Parliament's given its green light for a fair distribution of refugees, which has really forced the hand of the Council to do the same thing. (...) So I am extremely grateful to you, President, and to the members of this Parliament for having reacted so quickly, something I think really characterises this Parliament." "People are feeling uncertain in the light of the migration crisis and we need to show people that we are in a position to come up with the answers," German EPP member Manfred Weber said. "We don't need new ideas, what we need to do is to implement existing ideas, that is what's lacking." Italian S&D member Gianni Pittella said: "Walls, egotism, hatred, that's all negative and shows that we cannot manage and resolve problems. Let's move forward, so that we don't endanger the soul or indeed the future of Europe." Polish ECR member Ryszard Antoni Legutko said that the EU needs a long term objective concerning the refugee crisis: "What is the final state of affairs that we want to attain? The Council talked about the cultural and social criteria that had to be taken into account in the immigration policies. I think this makes sense. I'm afraid however that the Europeans have such a powerful system of taboos and inhibitions around the immigration question that there is not much hope for rational debate." 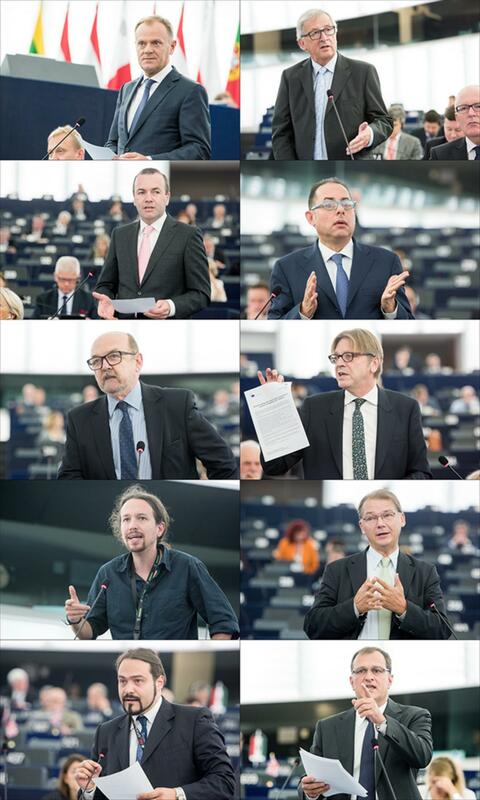 Belgian ALDE member Guy Verhofstadt called on governments to tackle the refugee crisis: "We suffer the consequences. It's not the not the Russians, nor the Americans. We are not taking any initiative at the European level for the moment. We even have three different opinions inside the Council. So take an initiative." Spanish GUE/NGL member Pablo Iglesias said: "I believe that there is hypocrisy at play. The European foreign policy over the last 15 years has not helped to resolve the wars and crisis. Spending more money is not going to be enough. I believe that we need to show less hypocrisy when dealing with all these problems." Belgian Greens/EFA member Philippe Lamberts said: "Dictators and those who do not take in any refugees at all should not be giving us lessons in democracy." He added: "The EU accounts for 23.7% of the world's gross national income. The 160,000 refugees the Council has decided to resettle constitute 0.2 % of world refugees. I think the EU can do better." Italian EFDD member Fabio Massimo Castaldo said that member states' approach to the crisis was “the sign of an internal crisis (…) that gives rise to internal barriers and threatens the stability and solidarity to us all”. French ENF member Louis Aliot said: "Yes, we need to provide assistance to those countries on the frontline, our Italian and Hungarian friends. But let's stop stigmatising Mr Orbán in Hungary who is doing his best in the face of a crisis." Konstantinos Papadakis, a non-attached member from Greece, said: “Refugees and migrants should be transported from their points of entry to their final destination by the European Union and the United Nations." Cécile Kashetu Kyenge (S&D) and Marian-Jean Marinescu (EPP) agree the summit marked rare solidarity, but call for action to resolve the conflicts driving migration. With controls being re-introduced at borders between Schengen countries, is free movement in Europe under threat? There's room for exceptions, the European Commission tells MEPs.